I’m visiting RWTH Aachen University for two weeks (until July 6). I’ll be presenting my work at the JIG 2018 in Lyon. My thesis is one of the three recognized with the 🏆Prix de thèse IG-RV 2018! I’ll be presenting my work at the EG 2018 Doctoral Consortium. The final version of my PhD thesis is now online. I’ve started a postdoc at GraphDeco, working with Adrien Bousseau. I’ll be giving a talk on shape from sensors at Comenius University in Bratislava. My PhD defense is scheduled for Friday, December 8 (2pm). Our Morphorider paper has been accepted for the IEEE Sensors 2017 Conference. I’m presenting the Shape from Sensors paper at SMI ’17 (part of S3PM 2017). Starting early ’18, I’ve accepted a postdoc position @ GraphDeco! I’ve visited GraphDeco (Inria Sophia) and presented my PhD work. 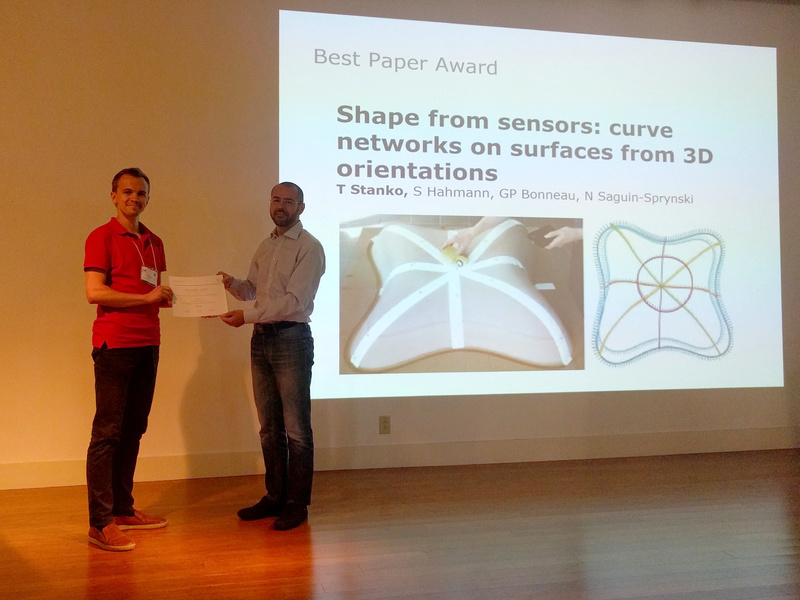 Our paper on Shape from Sensors has been conditionally accepted to SMI!